A gate valve is a linear motion valve used to start or stop fluid flow; however, it does not regulate or throttle flow. The name gate is derived from the appearance of the disk in the flow stream. 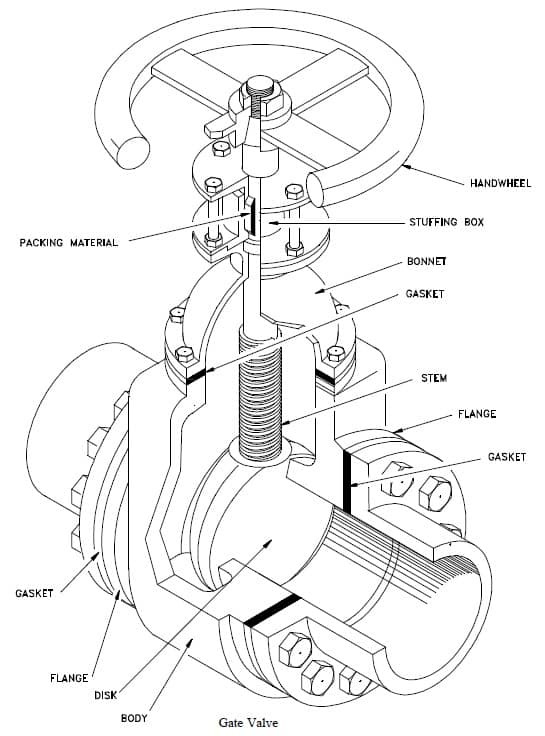 Figure illustrates a gate valve. The disk of a gate valve is completely removed from the flow stream when the valve is fully open. This characteristic offers virtually no resistance to flow when the valve is open. Hence, there is little pressure drop across an open gate valve. When the valve is fully closed, a disk-to-seal ring contact surface exists for 360°, and good sealing is provided. With the proper mating of a disk to the seal ring, very little or no leakage occurs across the disk when the gate valve is closed. On opening the gate valve, the flow path is enlarged in a highly nonlinear manner with respect to percent of opening. This means that flow rate does not change evenly with stem travel. Also, a partially open gate disk tends to vibrate from the fluid flow. Most of the flow change occurs near shutoff with a relatively high fluid velocity causing disk and seat wear and eventual leakage if used to regulate flow. For these reasons, gate valves are not used to regulate or throttle flow. A gate valve can be used for a wide variety of fluids and provides a tight seal when closed. It is not suitable for throttling applications. It is prone to vibration in the partially open state. It is more subject to seat and disk wear than a globe valve. Repairs, such as lapping and grinding, are generally more difficult to accomplish. seat, or refacing of the seat in place. Valves being used in corrosion service should normally be specified with replaceable seats. Gate valves are classified as either rising stem or nonrising stem valves. For the nonrising stem gate valve, the stem is threaded on the lower end into the gate. As the hand wheel on the stem is rotated, the gate travels up or down the stem on the threads while the stem remains vertically stationary. This type valve will almost always have a pointer-type indicator threaded onto the upper end of the stem to indicate valve position. Figures 2 and 3 illustrate rising-stem gate valves and nonrising stem gate valves. The nonrising stem configuration places the stem threads within the boundary established by the valve packing out of contact with the environment. This configuration assures that the stem merely rotates in the packing without much danger of carrying dirt into the packing from outside to inside. Rising stem gate valves are designed so that the stem is raised out of the flowpath when the valve is open. Rising stem gate valves come in two basic designs. Some have a stem that rises through the handwheel while others have a stem that is threaded to the bonnet. Seats for gate valves are either provided integral with the valve body or in a seat ring type of construction. Seat ring construction provides seats which are either threaded into position or are pressed into position and seal welded to the valve body. The latter form of construction is recommended for higher temperature service. Integral seats provide a seat of the same material of construction as the valve body while the pressed-in or threaded-in seats permit variation. Rings with hard facings may be supplied for the application where they are required. Small, forged steel, gate valves may have hard faced seats pressed into the body. In some series, this type of valve in sizes from 1/2 to 2 inches is rated for 2500 psig steam service. In large gate valves, disks are often of the solid wedge type with seat rings threaded in, welded in, or pressed in. Screwed in seat rings are considered replaceable since they may be removed and new seat rings installed. • Sizes available range from standard cast configurations as small as 2″ to special fabricated valves exceeding 100″. • Standard cast configurations have ASME 125/150 bolting patterns and are rated at 150 psi. • Provide unobstructed flow paths that not only provide high flow capacity (Cv), but even allows slurry, large objects, rocks and items routinely found in mining processes to safely pass through the valve. • Relatively low pressure limitation – general pressure limitations are 150 psi at maximum.